I'm going to be honest and tell you that the very front part of our garden has been a bit of a disgrace for the last few years. Our front garden is divided by the drive that runs diagonally through it and the land slopes away from the house. The section between the house and the drive is fine but the section down to the road is totally neglected, probably because we never see it from the house and we have no cause to walk by because after one more house on each side of the road its a dead end, a cul de sac in fact. We sort of ran out of ideas about what to do with this area, stuck in some trees and shrubs then let things get out of hand. Once someone came to the house and expressed great surprise that we had such a lovely back garden, giving me the definite message that the front arrangement was not that of an avid gardener, still proves I'm not a show off, the opposite of 'all fur coat and no knickers' I suppose. Well things have changed, I've been working away over the last week and then at the weekend Mr FF joined me and we've made great progress at the front. All the weeds, mainly grass, have been removed and the new rhododendrons have been planted along with a few cuttings I had in stock. I shall put the daffodils that were in pots on the patio out there soon, plus maybe some primulas I can split and various bits of ground cover. Surprisingly it is quite a nice area of the garden, looking back up to the house and though I don't suppose we shall ever spend much time there it does look colourful from the road, so the postie might appreciate it at least. Today it rained which stopped me finishing off, there's just a bit more weeding to do, but the soil turned very dark accentuating the plants, polishing their leaves and watering in the new ones. Mr FF and I have spent much of today moaning gently as we move about, it was hard work and we ache but in the way you don't mind too much because you've achieved something. 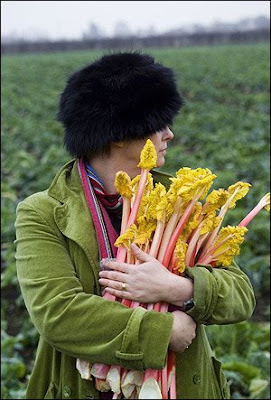 I love Sarah Raven, I totally agree with her gardening and cooking philosophy, I want to be here. I knew she was married to the writer Adam Nicolson but I hadn't realised until watching the recent BBC Sissinghurst programme that the family had moved into the former home of Adam's grandmother Vita Sackville-West and were battling with the National Trust to turn the castle back to a working farm and garden providing fresh home grown ingredients to the restaurant. I can understand how this must have felt like wading through treacle. A friend of mine worked in the kitchens of a National Trust property in North Yorkshire, baking delicious cakes, scones and biscuits for the tea room there. When she took up the post the kitchen was producing tiny little scones, less than half the size of a normal one and selling them in pairs. My friend wanted to make bigger scones but she was never allowed to do this, she and I found the miniature ones really irritating and I imagine most of the customers did too. I recently sent for Sarah's kitchen and garden catalogue, as much for inspiration as anything else. 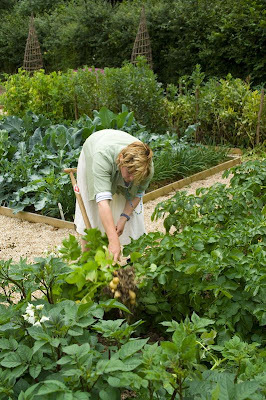 It contains a good selection of vegetable, herb and flower seeds, some beautiful collections and an array of great things for the garden, including an amazing pair of lace up boots that Sarah does wear herself. I spent a happy half hour yesterday sitting out on the patio drinking coffee, reading and wondering about those £75 boots. Best of all I got a free packet of seeds with the catalogue, cream sweet pea Mrs Collier which scores 8/10 on Sarah's fragrance scale. I'd already started my sweet peas for this year but I did sow a few from the packet yesterday because I couldn't resist, I am keeping most of them for next year. So I've been busy in my own kitchen garden planting seeds, broad beans, sugar peas, spinach, salad leaves and some companion marigolds and chamomile, Mr FF says it's still too early for most of these but I think Sarah wanted me to do it. I've been busy as ever in the garden, its looking good with plenty of colour, pretty spring plants and buds opening everywhere. There actually is a bee on the flowering currant in the first photograph. Mr FF was busy with the lawn, he spent many hours on Saturday raking out the old thatch and moss then put down some organic fertilizer, which unfortunately smells quite strongly of chicken poo. 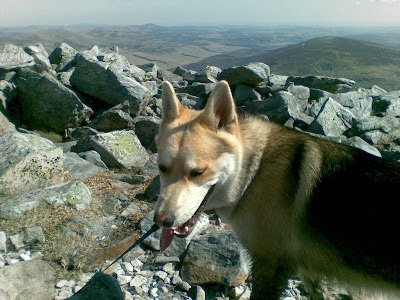 OK for him, he went off this morning to climb 3 munroes (Scottish hills over 3000 feet high). He sent me this photograph from the last top, where he met this handsome dog who might actually appreciate our strong smelling garden more than I did today, our cats certainly used to love the manure and enjoyed a good roll about it in. When I wasn't working in the garden last week I did a proper days work. I was at Edinburgh University invigilating for a 7 hour exam. I had to do a bit of preparation during the week and sit in with the candidates all day Friday. The exam itself was quite intense, no speaking whatsoever, even during the half hour break when we all ate our packed lunches together in the exam room. I was worried that I'd be bored sitting there and took about 4 books with me, plus some sock knitting though Mr FF didn't think that would be appropriate. In fact the time went really quickly, I read about half a book and spent the rest of my time watching the candidates working away. Getting up before 7 to shower, dress and eat before rushing out was quite a novelty, something I hadn't done since last July and I thoroughly enjoyed myself, but I think I might wait another 9 months before I work again, that seems about the right work life balance for me. We were at our friends' cottage on Easter Monday morning for coffee, chat and some cat cuddling. We shall be feeding Peaches again soon while her family are on holiday and we are really looking forward to that as we've been without cat contact for some time now. We took a stroll round their lovely garden and got chatting about daffodils. Shelagh told us she had been lifting and dividing clumps of daffs that were blind, ie they had failed to flower because they were too overcrowded. She said that last year she had planted some spare ones on the grass verge outside their cottage, beyond the realms of their own garden and lately she had put daffs and snowdrops into the newly planted woodland at the back of the cottage. I am much in favour of this idea, I planted daffs along the side of the lane that runs behind our garden many years ago. As you see, they have have settled in nicely. I also put down a few packets of wild flower seed and now have campion, ox-eye daisy, poppy and some interesting grasses spreading about. Fortunately they have never been damaged by cars driving onto the verge or by the council cutting the edges too early. I didn't know until Shelagh explained that this is known as Guerrilla Gardening, in fact there is a whole website that encourages gardeners to cultivate neglected public spaces. This reminds me of the silver thistle like Eryngium giganteum Miss Wilmotts Ghost, named after the nineteenth-century gardener, Ellen Wilmott, who liked to secretly scatter seeds of the plant in other people's gardens. I don't think I'll go as far as to sow lettuces in a burnt out car, but I may be sprinkling a few more seeds round the village. and in spring - point made, will you be joining the movement? A quick update combining my usual passions, garden and socks Two more pairs of put together socks from left over Opal, and still plenty in the scrap bag. I'm really pleased with the way the different yarns work together, these hardly look like patchwork socks at all though the last few pairs might be a bit more hotchpotch. A spring pair from the yarn I bought in France. I really like this simple herringbone rib pattern, Charade, by Sandra at I May Be Knitting a Ranch House, great blog name. We are enjoying some great weather here in Scotland, sunny and dry, in fact I was just speaking to a friend up the road who told me she has her flip flops on. I haven't reached that stage, still in socks. Anyway, we are both working hard in the garden and if I don't stop and get out there again there will be mutterings from Mr FF. Hope you are having a lovely Easter. On Saturday we took ourselves off in search of new plants. After our visit to Dawyck Botanic Garden Mr FF had decided that we needed more rhododendrons, preferably the early flowering varieties. They didn't have any for sale at the garden but recommended Glendoick Garden Centre near Perth, which specialises in rhodies. 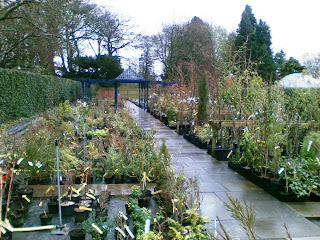 En route we called at Binny Plants in West Lothian, a proper nursery not a garden centre, no cards or flowery gift items in sight, nothing but beautiful healthy plants. I only bought a hellebore to add to my collection, White Lady, as you'd expect white but with interesting pink spots. It has nearly finished flowering so not worth photographing, but next year it will be stunning. Then over the Forth and on to Perth. Yes it was a dull wet day so no gardening time was wasted. Firstly at Glendoick a fortifying bowl of soup while Mr FF read the paper and I contemplated the immaculate gardens. Eventually I had to leave him reading to start looking round as I just couldn't wait any longer. We were fortunate that Carol Baxter, a presenter on BBC Scotland's Beechgrove Garden was on the premises for the weekend and she very kindly came over to offer advice when she saw us dithering. She wisely steered us away from the really early flowerers when we explained our location, 900 feet above sea level in a frost pocket, and we came away with this fine selection. I've only planted Christmas Cheer so far, the pale pink large flowered one on the left, but we have been motivated to clear out and prune some of the front garden to accommodate these treasures and for the moment they look very beautiful standing beside the front steps. Today all my thoughts are with those affected by the earthquake, my heart goes out to the victims and helpers. I was already on a high with all the spring growth and sunny days when my niece phoned me on Wednesday evening. Kerry who was married in July 2007 is my eldest niece and my god daughter. She is expecting a baby in November, around the date of my birthday. So the little girl who first came to stay with us when she was three is going to be a Mum. I remember how she used to shake our cats bean bags and then bury her head in the middle to make a cosy hollow for them. As a toddler she went through a mad phase of talking about herself in the third person, Mum, she wants a drink etc. One time she said to me She wants to go to the toilet, OK off you go I replied, you can manage. Oh no was the reply, you take her, I took her last time. This is such exciting news, the first of a new generation for our family, my brother will be a grandfather, I shall be a great aunt. 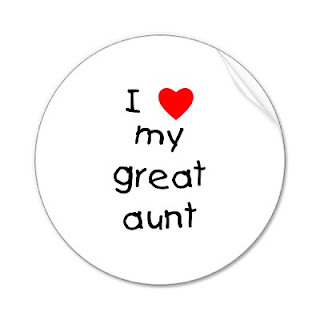 Actually I'm not that enamoured at being a great aunt and apparently neither are the other two great aunts to be who sat beside me at Kerry's wedding in the special Aunt's row second from the front. I have memories of my Gran's sisters, Alice, Emma and Kit, who seemed very old and not very interesting when I was a child. All three were widows who spent their days in chairs beside the fire, at least that's what they were doing whenever I went with Gran to visit. Obviously I won't be like that, I'll be in a chair beside the fire knitting. It goes without saying that I am excited by all the knitting opportunities and while I'll have to wait to find out whether its a boy or girl before I start any clothes, I can press on with booties and blankets. I wonder if I can find a pattern for maternity socks. Yes, I did check that the call wasn't an April Fool, it was after midday anyway.